We took a little longer to visit ISPO this year, and the show is well worth that extra day. Over the two days of walking around the show we clocked up over 25km; so what grabbed our attention on this mini-marathon? There weren’t any massive crowd pullers this year like last. Last year the Marker Kingpin looked like a London bar on a Friday evening, 4 or 5 deep with people jostling to get their hands on the hybrid touring binding.This year we just didn’t see that sort of interest in any on product but a few things were noticeable. One thing that was obvious from this years show is that backcountry and touring is definitely the growth market for skiing. We almost lost count of the number of brands offering touring boots and tech style touring bindings, even if some of them were just rebranded Dynafit kit. But there has also been definite innovation in this sector, especially in the adoption of lightweight materials such as carbon fibre to reduce weight while maintaining downhill performance. 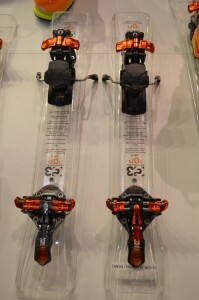 This was also evident with the likes of Scarpa offering a Freeride range,which demonstrates that the technical mountaineering market and recreational skiing markets are starting to see an overlap, and it’ll be interesting to see how the two markets approach the same market sector. 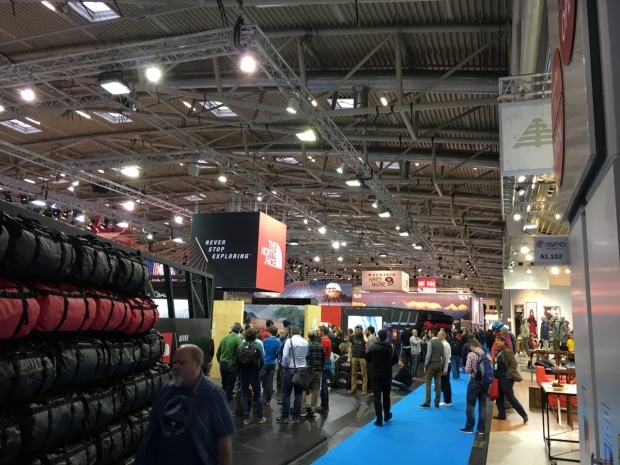 Indeed, there were almost as many skiing related products in the ‘outdoor’ sector of the show as in some of the dedicated skiing halls. We’ll be looking at this crossover in a later article, so watch this space. 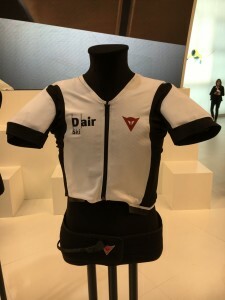 were displaying their new electric airbag, similar to the Black Diamond Jetforce, but there was just one on display and no real opportunity to get your hands on it nor see how it operated which was a little disappointing. One partnership we spotted was that Pieps are marketing their own range of airbags with ‘jet force technology’, but again, there wasn’t much chance to play properly with them. 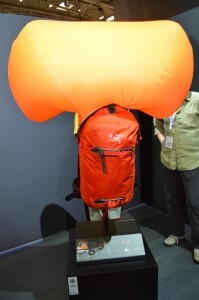 The ABS, Ortovox and Mammut stands, however, were busy with interested parties toying with the kit, and we noted that other manufacturers are getting in on the gig by making the compatible bags that zip onto the modular ABS system. The majority of offerings for boots in the recreational skiing market don’t seem to have changed much beyond the expected cosmetic updates. As we said, however, it was noticeable that most of the mainstream manufacturers have developed, or at least rebranded their own range of backcountry or entry level touring boots. There was a notable increase in the number of companies offering protective equipment, whether it was back protectors, helmets or even the airbag protection from Dainese. This last piece warranted a closer look, not least because it shares the technology already in use in MotoGP, but also that in two crashes in recent downhill races, it’s claimed to have lessened the injuries significantly. We spoke to Dainese to find out just how it works. Using a combination of gyroscopes and accelerometers, it is constantly calculating your orientation, the rate at which you’re body is changing direction or position, your lean angle and a whole host of other parameters that can be worked out from that data. In its development, they have been using pro skiers to work out what their normal limits are in terms of rate of change of body position or lean angle and I think, for the majority of us, we are not going to be pushing those limits ourselves. It’s when we go beyond those measured and extrapolated limits that the airbag deploys and I’m sure you’ll agree, if you exceed the forces, body rotation and lean angle of the likes of a World Cup downhill racer while on the piste, then it’s not unlikely that something has, or is about to go wrong, at which point the airbag inflates. I doubt were going to see blue runs littered with inflated airbags after someone has caught an edge, it takes a pretty significant fall to trigger it. Unlike Avalanche airbag technology, this cannot be refilled by dropping it off at a shop or visiting a scuba centre to get the cylinder recharged, it needs to be replaced in its entirety but the expectation is that, like with a car airbag, if it goes off, then the incident is severe enough that getting it refilled won’t be high on your list of priorities. With helmets, more and more were showing the adoption of MIPS or similar technologies. This system helps limit the rotational forces transmitted from the helmet to the head in the event of a sliding fall. From my reading of various journals, I would say the jury is still out on how significant these twisting forces are when compared to other aspects of a collision or fall, but anything that will improve helmet performance can’t really be a bad thing. Helmets are another area that we are seeing more and more use of lightweight, technical materials further reducing weight to improve wearers comfort, but reducing the weight of a helmet will also reduce the overall inertia of the head so will also positively affect the performance of the helmet in the event of a fall. We were pleasantly surprised to see some genuine development in this area. I was starting to feel like there wasn’t much that could be done to progress goggles and lenses. Sure we have photochromatic lenses and there are replaceable lenses, but this year seems to have seen a leap in how these are applied. Salomon(?) have developed the mechanism by which the lens attaches meaning replacing a lens is now far easier, and doesn’t require you to muscle a lens into a stubborn rubbery frame at subzero temps. A push of a couple of buttons and it clips off, a quick push of the replacement lens sees you, literally, on your way again. I suspect, with sufficient practice, you’ll be able to doit without even taking the goggles off your face. Oakley has gone one step further in goggle technology, and have fitted a heating mechanism to the lens which helps prevent fogging. With the aid of infrared viewers, the temperature difference was quite visible. It’s an interesting development, but how practical it will be to the majority of us, I’m not sure.